QUITAPENAS, one word all caps, four syllables all claps, just to give you a taste of rhythmic contagion revealed in their self-­‐titled debut. Borrowing aesthetics from the radical 60’s, 70’s and 80’s, each song echoes a remix of history and invites one to engage in the liberating evenings of Angola, Peru, Colombia, Brazil and beyond. 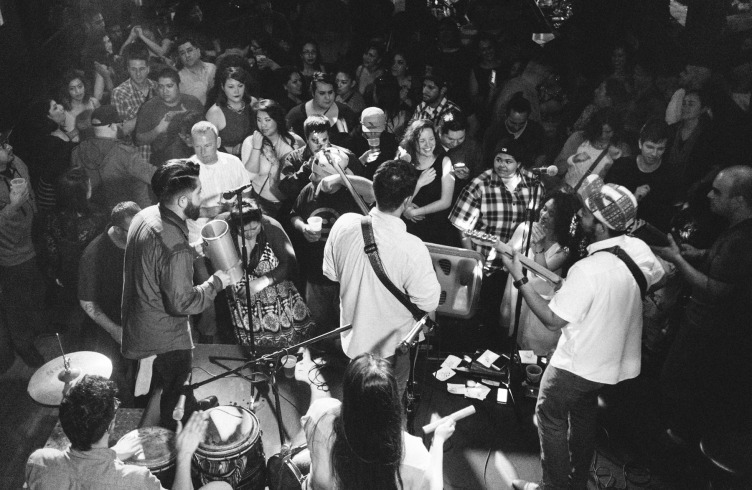 Photos by Carlos Quinteros Jr.
One may never guess at first listen a group of five California natives hailing from the heated Inland Empire would evoke such cultural richness. Throughout the full length, Dany “Choco” Gomez plucks a tico/soukous style of rhythmic and melodic fusion. 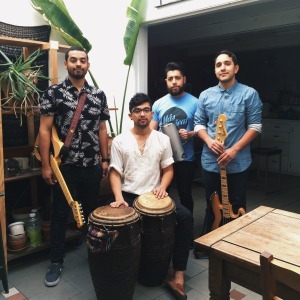 The drive of the band further pronounces mostly Punta, Puya, Champeta and Merengue in a solid three piece percussion back bone chaired by Eduardo Salvador Valencia, David “Dirty” Quintero and Mark Villela, grasping congas, caja and guacharaca. Finally, the quintet is carried through with bass and sometimes sax by Hector “Toto” Chavez. A call and response set of chants illuminate vocals led by Choco and sometimes Toto, forcing movement beyond hips and feet. The album hits the ground running with single Valle Moreno, which’s title may sound like an Inland Empire city, however paces a trance into that of a 1970’s Luanda nightclub. Choco grazes guitar rhythms, as the collective clutch an impeccable clap track. 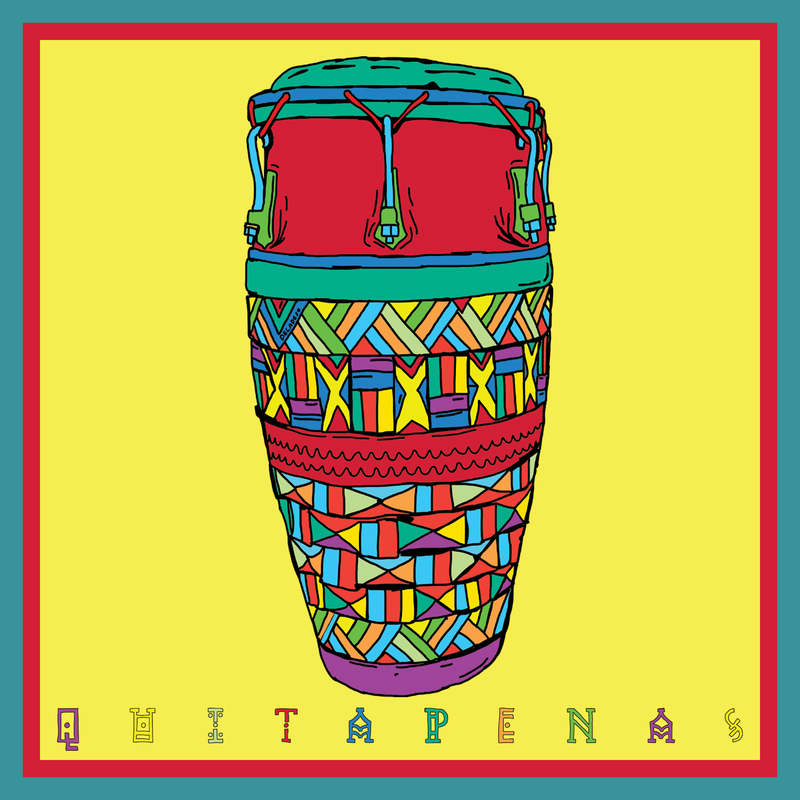 Another pun titled track; Os Quitapenas, invites homage to the parties of 1960’s psychedelic Peru, however the name foreshadows an Angolan highlife festival in its instrumental reckoning. Guayabo, my personal favorite, written by Eddie and arranged by QUINTAPENAS themselves, perceives as a fusion of emotional Tropicalia singing and strumming, held together by grooves of an everlasting afro-­beat. However, this jewel is actually a true story on Eduardo’s trip to San Basilio de Palenque. Also included in the work are previously released singles Justicia and ever so flirty Papaya, which perform more like occasions rather than songs. With consistent playful timbres and tempos Eddie, Dirty and Mark carry the party in every meter and measure. The final track, Vamos a Mi Casa sets free the Palenque roots of Afro-Columbian culture with the simple story of get the girl, but complex moves of Toto’s bass dance, and Choco’s melodic octave jumps. With production by Alberto Lopez of Quetzal and Jungle Fire, and artwork by digital artist Deladeso, the album is a prevalent contribution to the remix of a remix culture. Fall deep into the crevices of QUITAPENAS, and you will find earnest innovation, as each track truly is a gem for the books.